By this point, I’m assuming you own your own domain. Purchasing a unique domain name for your online presence and identity is one of the things I strongly recommend you do. Unfortunately, doing so also puts a target on your back. Your domain registration, by providing a public and required way to contact you, provides the means to aim for that target. Sadly, there is no shortage of individuals – ranging from simple opportunists to outright scammers – who would like to take money from you… money they don’t deserve. Their techniques are all based on assuming a simple lack of knowledge on your part. That’s something we can fix. I ran across this one recently, which is what brought this entire topic to mind. I’ll use my own “askleo.com” for this example, but substitute whatever domain or domains you own. Hi! I see that you own “askleo.com”. Would you be interested in purchasing the similar domain “askleon.com1“? Don’t reply. Don’t “let them know”. Hit the “this is spam” button instead. Let’s be clear about what’s really going on here. This is spam. Nothing more, nothing less. Treat it as such. There’s a good chance they don’t actually own the domain they’re “offering” you. At best, they act as a middleman, charging you an exorbitant price for their “service”. At worst, they’ll simply take your money, never to be heard from again. I did a “whois” lookup on the domain to see who owned it. (Something like http://whois.domaintools.com/example.com works well). It turned out the registration had recently expired. No one owned it. I went to the domain in question and found a parking page, indicating that the domain was up for auction by the registrar (GoDaddy). I purchased the domain directly from GoDaddy. For $10. Had I engaged the person making the offer, I could have paid them to act as a high-mark-up middleman. But why, when I could purchase the domain so cheaply myself? Now, I’m not saying that all these offers happen to be for expired domains that are available in other ways. Many are indeed hawking high-priced auctions, or trying to get significantly more money for a domain than it might be worth. My advice: do the research, of course. But don’t be distracted by individuals you don’t know offering you something you didn’t know you needed. That’s spam, pure and simple. 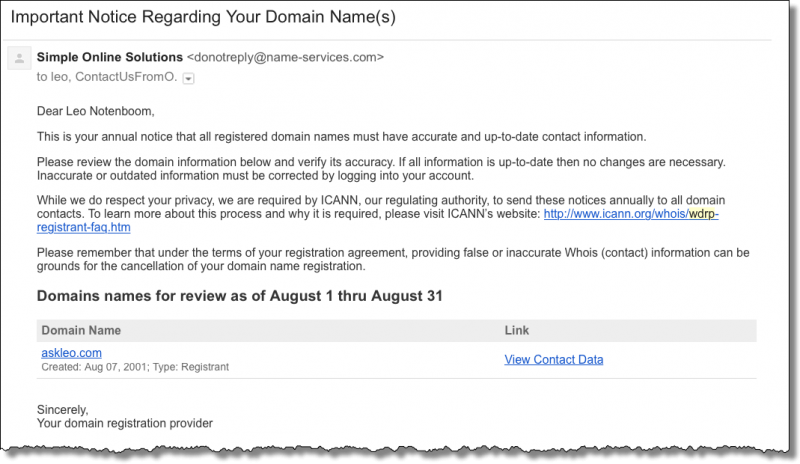 By now, you may well have received actual, physical mail offering to renew your domain, or perhaps warning that you could lose your domain if you don’t renew. It’ll look very official, and it’ll come from a very official-sounding “domain registry” of some sort. 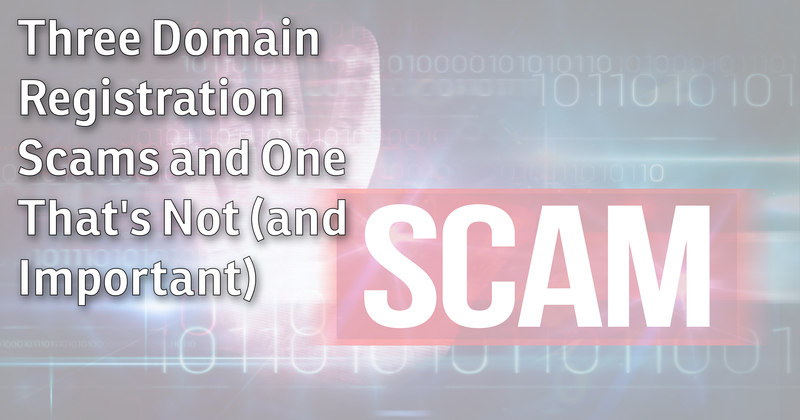 You’re tricked into believing this is legitimate, and that you need to renew your domain. So you respond to the mailing. Your domain is now registered with this other registrar, very likely at a much higher rate than you were paying with your original registrar. The only renewal and registration notices you should pay attention to are those from your own, existing, registrar – the place from which you purchased the domain. Yes, it’s possible to move domains from one registrar to another, but it’s just not necessary if you’re happy with the registrar you have. If I had a nickel for every one of those emails, I’d be a rich man. Sadly, the people getting the nickels are the people sending that spam, and the people paying those nickels – many, many nickels – are domain owners who have been taken advantage of. Don’t believe it. It’s spam. 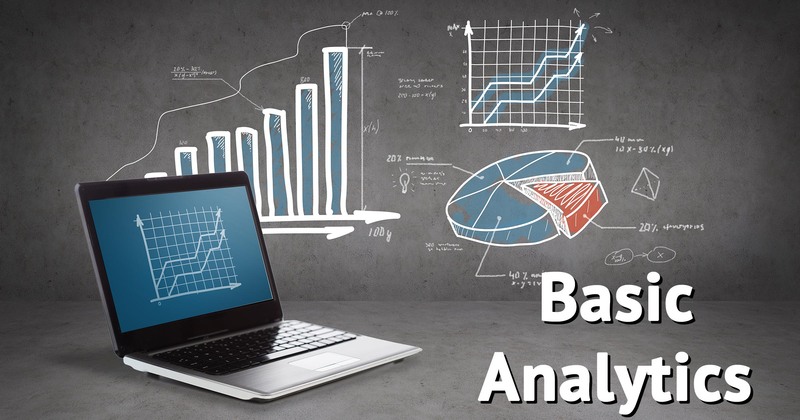 There are no shortcuts to producing good, valuable, content and building a reputation for your site to get yourself to rank properly in the search engines. You have to do the work. Take your money and provide nothing. Get you on page one of Google … for terms you don’t care about that don’t relate to your site or business in any way. Get you on page one of Google … for terms you do care about, using techniques that are explicitly forbidden by Google. Your stay at the top is short-lived, at best – just long enough for your payment to clear, I’m sure. In the worst case, your site can actually get banned from the search engines for some of the techniques these scammers use. Don’t fall for it. This one frustrates me, because it looks like spam, but you can’t ignore it. Here’s what’s happening: you are required, once a year, to confirm that your registration information is correct and up-to-date. You do this by clicking on the “View Contact Data” link in that email. In fact, you must do this. Yes, you must click the “View Contact Data” link for each domain listed in the email that looks like spam. If you do not, you may lose your domain. My natural inclination was to ignore the notice, because I knew my contact information was correct. Given that I own over 70 domains, it just didn’t make sense for me to take the time. Take the time. One of my domains (fortunately, not a highly trafficked one) was temporarily suspended as a result. I found out quickly, but it still took a couple of days to sort out, and during that time, my site was inaccessible through that domain. Even though it looks it, this one is not a scam. 1: For the record, I don’t own askleon.com, and it appears to be a parked page owned by someone in Singapore. My advice: don’t bother checking it out. 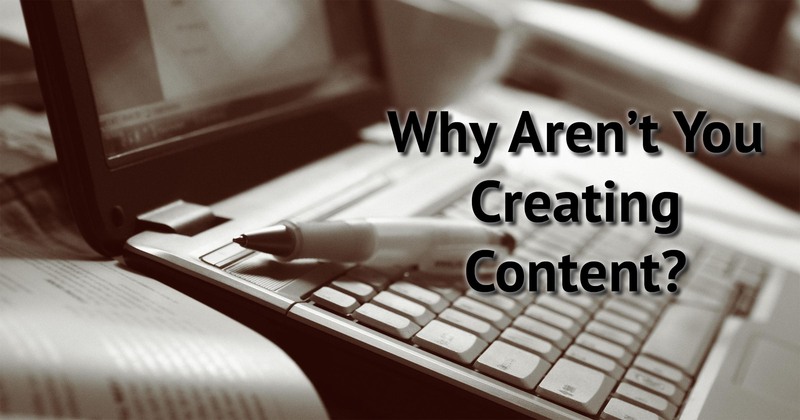 Next Post: Why Aren’t You Creating Content? Great info Leo. Can’t find this easily on the web or in the books I’ve looked at. Leo, instead of clicking the ‘view contact data” why not just go directly to whoever you purchased your domain from, and verify there? or go directly to ICANN to verify? Because clicking that link is what tells the registrar (or ICANN or whomever) that you HAVE checked. It’s not the checking that matters, it’s somehow telling them that you checked. Clicking that specific link is the only way I know to do so. Hey Leo. Great info on spam. I wold like to have my own domain, my own website. But as you know, there are several hundred different people offering a website, free, ad paid, no ads at all, shared, and I don’t know what else. How is a person supposed to know, 1) is this a good domain holder for me, 2) how to check them out, money, popularity, size, ?/ 3) What questions should be be asking, even if we don’t know the question that should be asked? 4) should we use a website builder, use a program like Joomla, or another? 5) use a site with mine as an extension, like .com/ horsehides. There are more questions but fewer answers, one says yes the sun is yellow, the next one say no the sun is orange and the next, well on and on. I guess this note goes on and on. Thanks Leo for your advice regarding the annual ICANN required confirmation of data. I cannot recall ever having received this request. I established my webpage in the late ’90s. It is devoted strictly to history and information, no sales or monetary transactions involved. Humm.